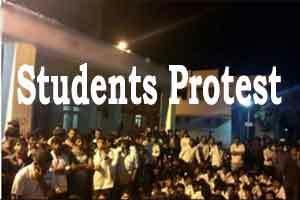 The Kerala Government Medical College, Ernakulam, recently witnessed a dharna at the Principal’s office by the staff including the doctors at the premise. The principal was reportedly gharoed as the protesters were upset over the cancellation of the internal function which was earlier scheduled on the same day. The occasion was reportedly cancelled because of a VIP presence on the occasion. Apparently, the VIP wanted to attend the occasion after the arrangements had been done. The staff got very upset with the development as the internal function was being held to distribute the first lot of five appointment letters to the staff as a part of the integration process. Many staff contacted by The Hindu alleged that the Minister for Public Works Department, V. K. Ebrahim Kunju, had intervened to stop the low key internal function organised by the medical college, so that it could be made into an elaborate function in which the Minister could also participate. However, Mr. Ebrahim Kunju, when contacted by The Hindu denied having intervened in the medical college’s function. The Principal, when contacted, said that he is a government servant but refrained from making a comment on the issue. The Kalamassery police lead by Circle Inspector Martin rescued the Principal and the Administrative Officer from the staff’s gherao.